Yes, this is indeed another post about Pinterest. But fear not, I come with real data to share albeit it in aggregated and anonymized format. It is well established that Pinterest offers great opportunities for lifestyle publishers but how well is it paying off in actual site traffic? To get a clearer picture I pulled referral data from the past six months for a group of 25 magazines sites that we work with at Define Media Group. I am not at liberty to share the specific sites due to confidentiality requirements but they are all well-known brands. I selected sites from several different major publishers that are a natural fit for Pinterest, specifically those that cover food, home, women’s fashion and entertainment. The level of brand presence and direct participation on Pinterest varies considerably among the examined sites. First the six-month traffic trends. To anonymize the data I combined all 25 sites’ figures into a monthly total. I was surprised to see the combined figures dip in February and March but this is skewed by the fact that one site had a massive spike in January. The overall trend line paints a clearer picture of the six-month timeframe. In February Pinterest traffic for 19 of the 25 sites increased compared to January and with one exception the declines were modest. However in March 16 of 25 sites experienced a decline compared to February, though again largely modest. Late January and February was red carpet season which could explain the lower March figures for the sites covering fashion and entertainment. But some of the sites in other categories experienced declines as well. It will be interesting to see what happens in Q2 this year. A 141% increase represents nice quarterly growth for the group as a whole. I did not expect the homes sites to have considerably less growth than the other categories although 45% growth is still substantial. However in drilling down it was clear that some of the home sites were already doing pretty well in Q4 2011. So the difference is partially attributable to some of the sites in other categories catching up in Q1 2012. 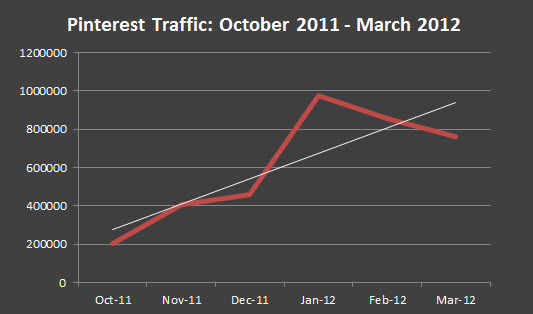 In Q4 2011 the most visits that any site got from Pinterest in a single month was 240K+. In Q1 2012 it was 400K+. Quite a few of the sites are getting less than 100K visits per month on average and some are still under 10K per month. 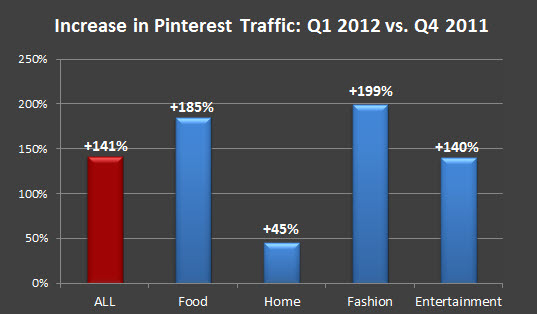 In Q4 2011 the highest percentage of total site traffic that Pinterest represented for any site was 2.5%. In Q1 2012 it was 5%. After a few top performers Pinterest represents 1-2% of monthly traffic for a handful of sites but for most it is less than 1%. In Q4 2011 Pinterest was a top 10 referring domain for 4 out of 25 sites. In Q1 2012 this rose to 9 out of 25. So even for lifestyle sites with content that is a natural fit for Pinterest the actual number of visits is still modest. But traffic is continuing to rise (with a much better trend line than poor Digg. See Publisher Survey: Reddit Traffic Way Up, Digg Way Down). Also keep in mind that the examined sites are all well-established brands that get considerable traffic from direct navigation, partner sites, search engines and other social media outlets, among other sources. Breaking in among their top referring domains is not any easy task. What traffic gains are trends are you seeing from Pinterest? Great data to share Adam. Thanks. So many posts out there about traffic and Pinterest, it’s refreshing to see something that is tangible. Pinterest has grown to become one of the biggest social networks. Now it will just be interesting to see if it has staying power. In order to remain relevant it will need to continually evolve it’s product offering or people will get bored. Yes, it will be interesting to see how it progresses. People sure seem to like it, so it’s got a shot. Thank you for taking the time to post concrete figures Adam. Too many people overlook the importance of empirical evidence, and all of the extrapolations it can provide. It will be interesting to watch this Pinterest trend and see if it continues or plateaus. Excellent post Adam, the graph seems to be pretty inspiring but eventually i can’t see much help from Pinterest to my site. But I like the way people like my images and repin it. Thanks Mitch. For many sites it is still early days for receiving substantial traffic from Pinterest. But in the right topics and categories – and with strong, compelling images – it is a growing opportunity.